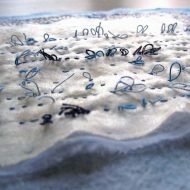 Stitch – Taking the ancient practice of stitch and interpreting it in the modern age, Gloucestershire Guild of Craftsmen Members, from a variety of disciplines, will be showing new collections of work. From narrative to function and embellishment, the work will be cross-referencing, complimenting and questioning traditional materials and approaches used in ‘Stitch’. This exhibition is part of the Select Festival www.sitselect.org. 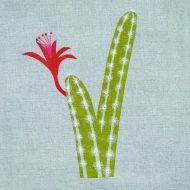 Stitch, decoration and function! These are the themes I investigate in jewellery for this exhibition. I use metal, linen and cotton to explore them. 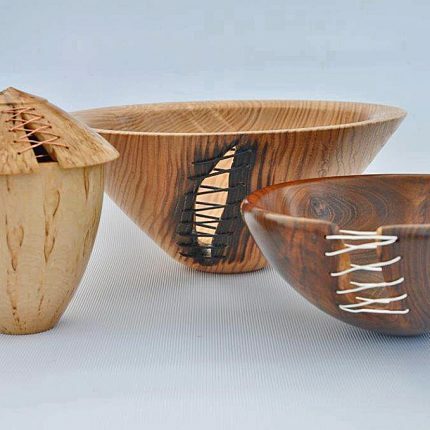 Taking the stitch theme into ceramics, Adrian has developed several ceramic vessels to explore the rippling movement of textile or leather tied together with bronze or stainless steel stitching to create unusual and captivating pieces. 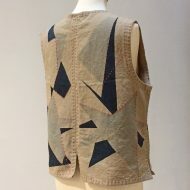 The ‘Running Stitches’ in this waistcoat are used both for garment construction and for decoration. Francesca has screenprinted some very simplified, graphic shapes of plants and foliage. She has then embroidered areas of minute detail that give an extra dimension to the image. 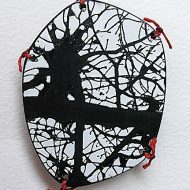 The ancient forest in Snowdonia inspires these brooches. 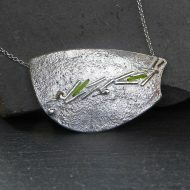 I wanted to remember the sense of growth, the trees, rocks, moss and the waterfalls and streams. Stitch is also an ancient way of joining things and I felt it was meaningful in this case to show how plants, rocks and water are all interlinked. 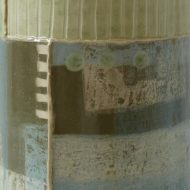 The enamel is high fired to give depth to the colours. 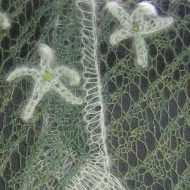 Stitches are slipped and the effect is to overlap some coloured threads and pass under others, the stitches are pulled into a pattern which is only discernible by the colour changes. 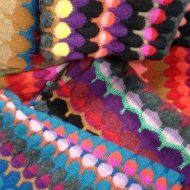 The scarves are based on a painting by Paul Klee called Rose Garden and his magical use of colour is hopefully echoed in this range of scarves. The stitches are knitted with cashmere and a small amount of silk, and my aim was to paint a picture with yarn. 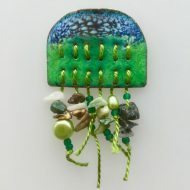 For ‘Stitch’, Jan has made brooches and matching buttons inspired by gardens. Scarves have been produced through exploring the method of shibori and the colours have been created using rusted object such as old metal keys with after treatments. 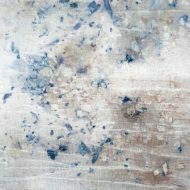 Also walnut husks and leaves have been used to achieve the inky blue tones. I have used mostly organic hemp based fabrics. 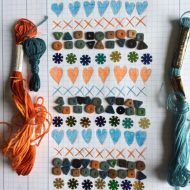 Cate will be reinterpreting knitted stitches as embroidery – mainly producing work/patterns based on fair isle knitting designs incorporating stitch, wire and reused/reclaimed items. This work reflects observations of details in the landscape. The hedgerow suggests strong linear marks moving along the edge of the field a kind of complex writing delineating the boundary. ‘Hedgerow Calligraphy’ is made from cotton organdie pointed and stitched by hand and sewing machine. Trailing threads suggest movement in the wind. ‘Stone Calligraphy’ recalls the complex marks on pebbles seen when walking along the beach. They are made with dyed felt and stitched by hand. 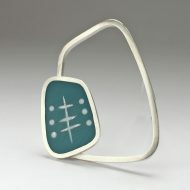 As a Jeweller, I have an interest in how components are put together and how elements are used to catch and fasten. Stitch is one part of this thinking. I have used ‘Stitch’ in its functional sense in that it helps me to fasten a brooch-front to its mount, which holds the brooch pin. 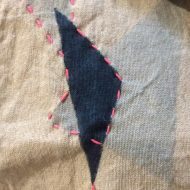 The material I choose for the stitch, be it steel-ribbon or linen thread, and the manner in which I stitch, adds a decorative as well as a functional element to the final piece. Stitch is fundamental to my work – it is part of the journey of making. 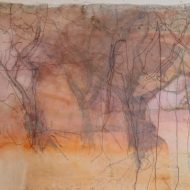 I am drawn to stitch also because of its contemplative quality in the art of mark making. Stitch is integral to our lives. 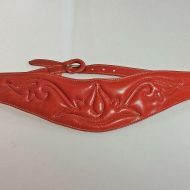 In its basic form it binds surfaces, fabric, leather, skin. It can be decorative, it can be Art. It has a fascinating history in every country and its variations are endless and inspirational. Louise will be showing samplers and handmade books. 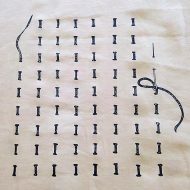 The element of stitch, particularly in dressmaking terms, has been a pivotal concept for me in relation to the development of my construction techniques. The sense of creating ceramic vessels out of multiple panels of clay enables me to use those individual facets to explore surface decoration and how one piece relates to the next. The construction process adds an extra challenge in balance as well as reaching for a pleasing aesthetic, much like a painter would a composition. Fastenings, clasps, buttons, collars, trims, seams, darts are a constant source of inspiration; but also the directional messages, the short hand, the code of the dressmaker found within the instructions of the pattern books. 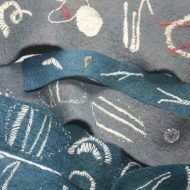 Although these elements are so ingrained in my current practice that they often become abstracted, they have been brought to the forefront again in this collection of pieces, some of which are multi-faceted almost to the point of patchwork, others are subtly suggestive of stitch through the joins as seams. The dots I regularly use on the interior rims of my pieces are a reminder of this history within my own practice, as they reference the draft paper used by the dressmaker. The platter, bowls and plates are decorated with a series of motifs created with paper resist stencils. 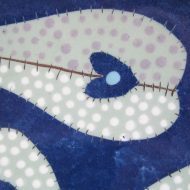 When the paper has been removed and polka dots applied the edges are then ‘stitched’ on to the pot using a needle as a tool for sgraffito. Motifs include cats, fish, chickens, lizards, apples and pears. The coasters are inspired by different embroidery stitches and paper patterns used for dressmaking, again using the technique of paper resist, with slip-trailing and sgraffitto for the stitches.